The Headsman is an Imperial executioner. He wears a set of unlootable and unplayable executioner's robes, an executioner's hood, boots, and gloves, and carries the headsman's axe. He is one of the first NPCs you'll meet in gameplay, during the initial quest, Unbound. 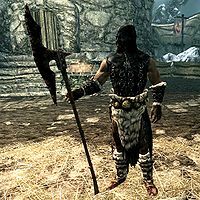 After you create your character at the start of the game and join Ulfric Stormcloak, Ralof, and the other prisoners near the execution block, you'll watch the headsman decapitate one prisoner before you're called up for your turn. 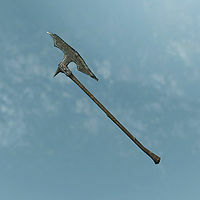 You are forced to make your way to the chopping block and kneel down to see the headsman lift his axe to execute you, but are saved just in time by a dragon attack. The headsman is then knocked down by the force of Alduin landing on the tower nearby. He staggers to his feet, then he gets hit by Alduin's Unrelenting Force shout and dies. His corpse can be seen lying on the ground next to the execution block. Two additional headsmen should have been included in a random world encounter, but it was never implemented. When you first enter Solitude, you will also witness the execution of Roggvir at the hands of Ahtar, the jailor, for treason. He is also a headsman, but has his own separate page. This page was last modified on 7 May 2015, at 19:31.